No one wants to be in a medical boot. It usually involves a painful injury. The medical boots, while they keep you mobile, are clunky, huge, and make you feel unfortunately, a lot like a stormtrooper. If only you had a light saber. You can try and make the best of your situation and hide it. Not by heading into the nearest dark closet, but by adding a cover. Yes – there are such things as fashionable covers for medical boots, aircasts, and walking casts. You don’t need to resort to a bottle of glue and some glitter. 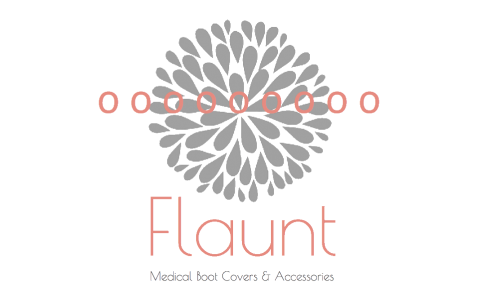 Flaunt Boots has stylish covers for you! We’ve designed covers to help you match a boot or shoe you may already have in your closet. Wear a cover on your medical boot, and a similar boot on your other foot. While we can’t make the medical boot-ness disappear entirely, we can really help minimize its effect on your overall look. Not to mention a cover will help keep your toes a bit warmer and dryer. While you are healing from an injury, you deserve to Heal Beautifully! The Portland Rain Boot in ivory linen/solid black reversible. Water resistant. Made in the USA by a small women-owned business.